Details about Rennsport Reunion V have been trickling out since it was first announced late last year, including a date change of the event from October to September 2015, but the tap has been opened with the launch of the official Rennsport Reunion V website, the social media hashtag — #PorscheRRV — and the official logo. We'd recommend paying attention to that hashtag in the months leading up to — and during — RRV whether you're on Facebook, Twitter, or Instagram, as you never know what juicy Porsche content will appear. In the meantime, head over to the official RRV website to pour over the latest updates, such as the event schedule, vehicles and drivers that will be in attendance, photo and video galleries from past Rennsports, and general information and history about the event. Atlanta. 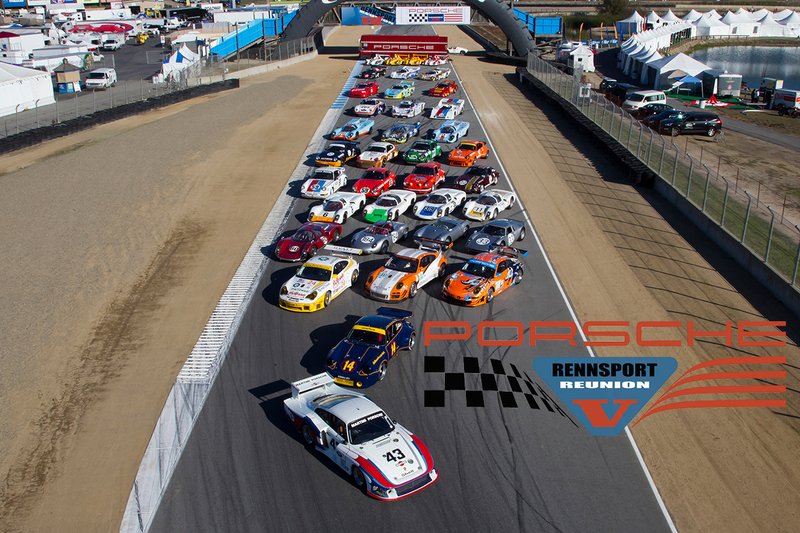 Today, Porsche Cars North America, Inc. released new details for the highly anticipated Porsche Rennsport Reunion V being held at Mazda Raceway Laguna Seca, September 25 – 27, 2015. This year’s Reunion, the fifth installment of what has become a Porsche tradition in North America, will highlight Porsche at the legendary 24 Hours of Le Mans. As the most successful marque in the history of the famed 8.47 mile Le Sarthe Circuit, with sixteen overall race victories between 1970 and 1998 and 100 class victories, Porsche returned to the top level of Sports Car competition with the 919 Hybrid LMP1 Sports-Prototype in 2014. On the official Porsche Rennsport Reunion V website, www.porscherennsportreunion.com, Porsche fans have access to up-to-date information on the drivers and cars that are scheduled to attend, along with photos and videos from past Reunions. Links to Mazda Raceway Laguna Seca’s website for tickets, registration and track information are also available on the official website. Building upon the theme from Rennsport Reunion IV, the Porsche Design Studio in Zell am See, Austria rejuvenated the familiar logo for Rennsport Reunion V. The logo will appear on official communications, strategic locations around the track, and on select merchandise. For followers of Social Media, #PorscheRRV has been chosen to be used for tagging photos, video and social media content. It is welcomed for fans and enthusiasts to use the new hashtag on any Porsche Rennsport Reunion related subject matter. Future details will be published on Porsche’s press website (www.press.porsche.com) and Mazda Raceway Laguna Seca’s website (www.mazdaraceway.com), as they become available. Ticket information is available by contacting 800-327-7322 or online at www.mazdaraceway.com.